Remove Browse With Paint Shop Pro 7 from the context menu (Paint Shop Pro) - TACKtech Corp. Paint Shop Pro by Jasc Software is a wonderful program with one exception. 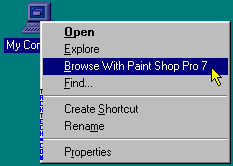 It lacks the ability to remove Browse With Paint Shop Pro 7 from the Windows Right-Click-Context-Menu. This article will show you how to remove it. 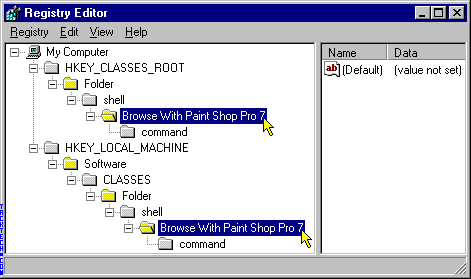 To restore the Browse With Paint Shop Pro 7 entry. Value: "C:\Program Files\Jasc Software Inc\Paint Shop Pro 7\psp.exe" "/Browse" "%L"